I was coincidentally on 390S on June 16, 2009 when I took this picture. I didn't know at the time that the bear was already dead. It has been a year since a bear died after falling from a city neighborhood tree in Rochester, NY. The case is considered closed. That is sad. After watching the video perhaps you will disagree with the closure. Not everyone has respect for animals or wildlife. I get that. Some people will never enjoy that kind of connection. What I can’t understand is how people that are employed by the Department of Environmental Conservation could be so blatantly negligent in protecting this animal. It appears thousands of tax dollars were spent on the elaborate bear trap and SUV that carries it to it’s grave but little to none were spent on preparing or supporting the person driving it. We live in a world where we give national attention to an umpire in tears for a blown call but almost none to watching an animal crash to it’s death. People cheered when the animal fell 60 feet to the ground. I am giving them the benefit of the doubt that they didn’t realize it would fall so violently. The bear wasn’t going to come down with a crowd of people surrounding it in broad daylight. Common sense, right? Rather than waiting until nightfall or clearing the surrounding crowd and settling the situation down it was decided that it was more cost effective to tranquilize the bear and let it fall 60 feet into a stretched nylon net. Watch the video and it will become quickly apparent that the net wouldn’t have saved a cat falling that distance. The DEC reported that the bear died of suffocation. How many of you believe that? I don’t expect much to be done after writing this. It has been a year since this happened and was forgotten only a few days after it occurred. I’m writing this out of respect. 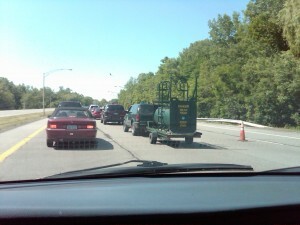 No one else seems to care that their tax dollars are spent on bear traps and SUV’s that act like a hearse. Thanks Tommy. Seemed like the least I could do after seeing this happen last year.